Since the first settlers of the community landed on Conscience Point on June 12, 1640, they organized the need for fire protection. Our first organizations were in the form of bucket brigades alerted by the village blacksmiths banging of his rim. Since our company pre-dates the incorporation of the Village of Southampton in 1894, that portion of our history has been lost to time. The records to note the existence of the Hook and Ladder Company before its official charter, granted on December 22, 1890 to 28 men and a company owned, hand drawn ladder truck, stationed in a fire department owned firehouse on Job’s Lane. The foundation of this first firehouse still exists at 76 Job’s Lane. Our old timers told many stories of racing the hand drawn trucks to fires, locking wheels, and events that these actions precipitated. For the next twenty-one years, these men and their hand drawn equipment protected our village. On November 3, 1911, our village fathers consented to buy a motorized Hook and Ladder truck, manufactured by American LaFrance. This unit served our community for the next 34 years, until its retirement to the Long Island Motor Museum in 1946. On or about the year 1929, the Hook and Ladder Company undertook to build a Light Plant on Chevrolet. This served us until 1954. As our village grew, the need for a larger and more modern firehouse was created. The village built the Windmill Lane Firehouse in 1923. 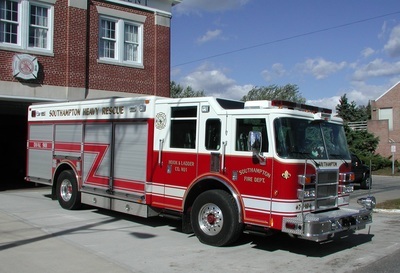 The Hook and Ladder Company and the Agawam Engine Company sold the old firehouse and the money was equally divided, laying claim to the wealth of the Hook and Ladder Company. 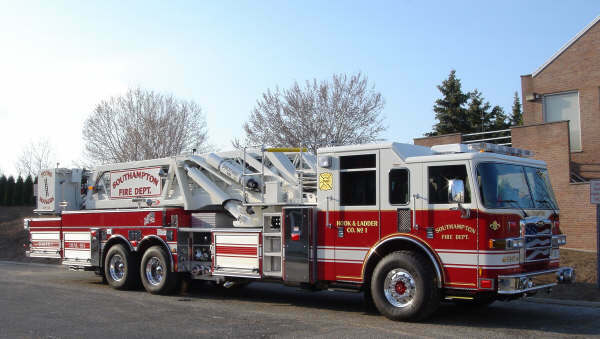 After World War II, and the organization of the company, it was decided to request the village to purchase an up to date Hook and Ladder truck; a 1946 American LaFrance 65 foot hydraulic extension ladder truck. This truck served us for the next 27 years. After 25 years of service and the invention of the portable generator, a new light plant was purchased. It was a 1954 Dodge Power Wagon with a generator and electric lights. In 1973, in accordance with insurance service organization guidelines, a new Hook and Ladder truck was purchased; a Sutphen 75 foot telescopic aerial platform. This was a modern concept of rescue and fire fighting equipment, with air breathing system and a foam system. As time progressed, fires became more complex, and the need for quick responding, lightweight vehicles, with capabilities for extinguishing gasoline and oil fires arose. This need was particularly great in the area of oil burner and car fires. 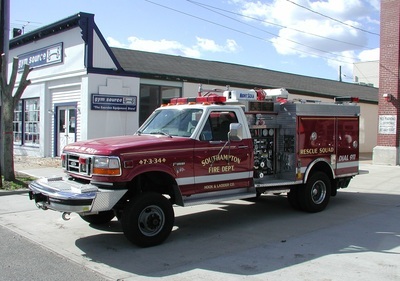 In 1974, a Pierce Mini-Pumper was purchased with the capabilities. As responses to auto fires and accidents rose in numbers, the need for heavy rescue and extrication equipment was more prevalent. In 1976, to serve this need, the Hook and Ladder Company acquired a new light plant with extrication tools, such as the Jaws of Life. Our ever-expanding community grew with leaps and bounds in the 1960’s and the 1970’s, particularly in the Shinnecock Hills and Watermill areas, where water mains did not exist. To fill this need, Hook and Ladder Company, through the chiefs and the village, produced a surplus G.I. truck in 1972, on which a 2000 gallon water tank was mounted. This unit took care of the east of our district. In 1979, a 2500 gallon tanker was purchased for the other end of the district. This tanker is still in service today. From its humbling beginning to the present day, the forty volunteers of the Southampton Hook and Ladder Company have maintained a steadfast watch over our lives and property of our fellow citizens. 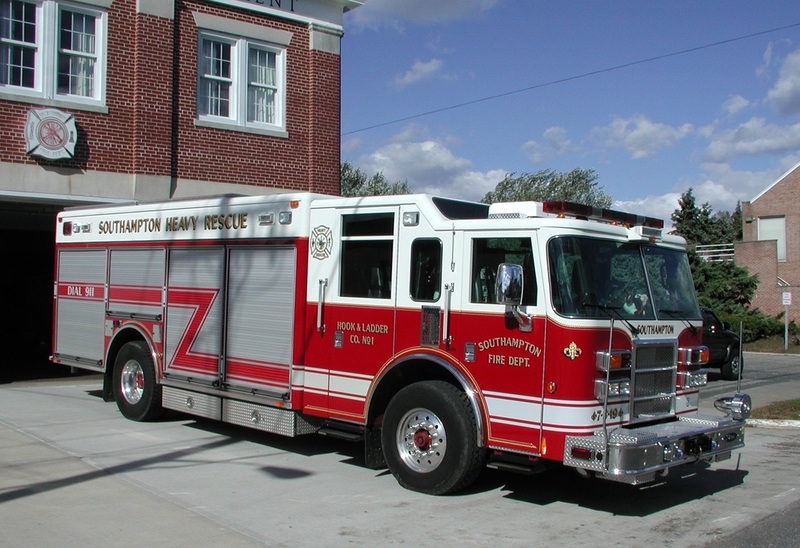 Today the members of Southampton Hook and Ladder Company protect our district and respond to all emergencies in the following apparatus, (1) 1973 Sutphen 75 foot aerial platform, (2) 1979 2500- gallon tanker, (3) 1996 Pierce Bronto 134 foot aerial platform, (4) 1997 Pierce Mini-Pumper and (5) 2003 Pierce Heavy Rescue.